It is imperative that you assist us in selecting the proper prince for my daughter. We are the reigning monarch of a small but significant country, governed by our ancestors for generations. The princess, our daughter and sole heir, is now of marrying age. For the good of the country and our lineage, we have decreed that she will wed a prince worthy in all respects. Sadly, princes -- worthy or otherwise -- are few. The only ones who have answered our decree are the three sons of the King of Grolmavia. This neighboring country exports tubers and tin, is politically stable, and has a stolid and manageable population, so we find this acceptable. Tradition dictates that we give the suitors a challenge, and the successful prince will marry the princess. We lack, however, challenges appropriate for royal suitors. We have no monstrous creatures loose within our borders to be slain, nor do we find it acceptable to have our daughter kidnapped by an ogre or evil mage so she may be rescued. We have been tempted to skip the quest, as the eldest prince is the only one with athletic ability. The middle one is bookish and the youngest has no discernable skills, so we considered merely declaring the eldest the winner, but tradition must be observed. We command that you provide us with a task befitting royal rivalry for the princess, so that she may be married to the prince we've chosen! It's good to be the king, isn't it? Making Decrees and Pronouncements, ordering everyone to do your bidding and having the peasants bow and scrape. (I understand the bowing, but what's up with the scraping? That sounds uncomfortable.) Oh, sure, "uneasy lies the head" and all, but you get to wear a pointy metal hat. That makes up for a lot. However, while you're caught up in all the perquisites, noblesse oblige and wedding plans, I notice that you haven't mentioned how the princess feels about all this. I get frequent letters from daughters wishing to avoid arranged marriages. I suspect a modern princess isn't going to meekly accept her pre-assigned groom. Ordering her to do so won't help; trust me. Like many people who write to me, you're asking the wrong question. You don't need a challenge to be won by the prince that you find acceptable, you need a solution that satisfies everyone involved. You probably think that you know best and if you're happy, everyone else is happy, but monarchs who adhere to this often end up mad, alone and wandering storm-tossed moors. Let's avoid that, shall we? It sounds like we're dealing with the typical triad of princes: The eldest (we'll call him "Hero"), is the strong, handsome one, skilled at the manly arts of combat. The middle one ("Scholar") is skinny and pale, but intelligent and erudite. The youngest ("Doofus") is almost average in looks and brains, can't do anything right, and everyone feels a bit sorry for him. You favor the Hero, but your daughter undoubtedly finds him shallow and vain. The Scholar is introverted and distant. And nobody considers the Doofus a serious contender. How can this possibly work? I never thought I'd recommend this to anyone, but your best plan is a Reality TV show. They're still surprisingly popular, and will be good practice for being in the public eye. Plus, you can earn a bit of money for the royal treasury by selling the show. Advertising dollars are a better bet than the next crop of tubers. Isolate the four of them in a resort for a few months, with exercise equipment, a library of textbooks and a deck of cards. Have them compete in a series of silly games and tell them the prince who wins the most points gets to marry the princess, although they won't know the point distribution until the end. To keep your daughter from resisting, secretly tell her that A) she doesn't have to marry anyone if she doesn't want to, and B) she is the one who grants the daily allotment of points, for any reason she chooses. She'll vow that you'll never force her to marry any of them, but don't worry about that. This is like a magic trick where the outcome is predetermined, and the only challenge is to make the person drawing the card think they ever had a choice. Here's what happens: The Hero will dominate in the physical challenges. The Scholar will win the mental games. The Doofus will try hard, but fail repeatedly. The important bit occurs during the long hours of tedium when they're not engaged in these stunts. To mitigate the boredom, the Hero will spend his time exercising and admiring himself in the mirror. 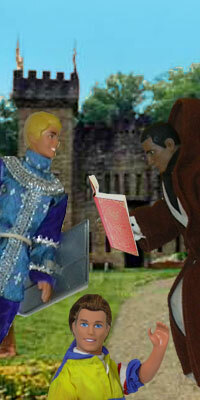 The Scholar will sequester himself in the library. This leaves the Princess and the Doofus little to do but play cards and talk. I'd bet a box of doughnuts (Mmmm, Royal Pastries!) that within a couple weeks she's awarding Doofus the full allotment of daily points. When he's not being eclipsed by his royal brothers, he'll turn out to be quite personable. He may not be a genius, but he'll be able to make her laugh. He isn't a champion, but he'll make her feel special. When she stops thinking of him as a loser, she'll see he has a good heart, is gentle and kind, and will adore and treasure her. By the end of the show, you won't be able to stop them from getting married. You may not think he's the best choice, but we're looking for a solution that meets everyone's needs. You've satisfied tradition with a challenge and gotten a son-in-law. The wedding will join the kingdoms. The oldest prince can lead the army, and he'll probably be thrilled to go dashing about on maneuvers, marching his troops up hills and down again. The middle prince will do well as chief legislative and judicial counselor. The youngest will be a kind and benevolent king, beloved by the people, and a devoted husband. Most importantly, your daughter will have realized he's not such a doofus after all, he's actually quite a charming Prince. And isn't that what every princess really wants?